Sometimes Nigerians who are desperate to join the Nigerian Navy fall victim and are defrauded by scammers who pose as recruitment agents or claim to have links with the Navy. Everyday is for the thief and one day is for the owner. That is the case of Yohanna Ahmadu, who is not a Naval officer or even a recruitment agent, but he parades himself as one. His attempt to defraud one Mr Adamu Ibrahim during the last nationwide recruitment exercise of the Nigerian Navy landed him in trouble. The Nigerian Navy said arrested Ahmadu, 27, whom it referred to as a suspected recruitment fraudster after it asked its victim to play along. His arrested was announced in a statement by the spokesman for the Navy, Navy Captain Suleman Dahun. Quoting Commodore Gbolahan Olubode–Fazaz, the Commander Naval unit Abuja, Dahun said the suspect had charged his victim 50,000 Naira and promised to get him enlisted into the Nigerian Navy. The spokesman further alleged that the fraudster had directed the victim to the Nigerian Air Force (NAF) Base in Kaduna and promised that his “boss’’ would assist in the exercise. “The suspect demanded the sum of 50,000 Naira from his victim before releasing a fake Nigerian Navy appointment letter which he will use to report for the training at the Nigerian Navy Basic Training School, Onne, Port Harcourt. 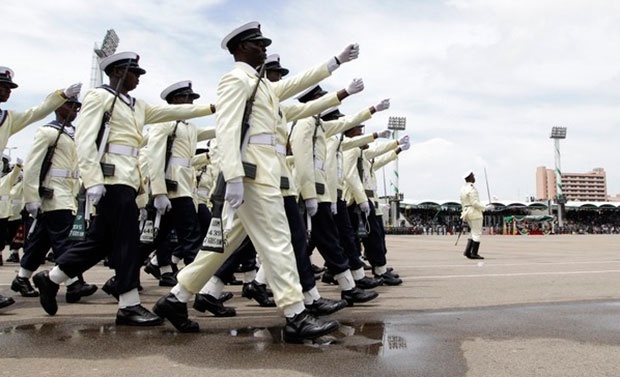 The Nigerian Navy then warned interested Nigerians to be wary of recruitment websites that would always ask for money, emphasising that recruitment into the service was free of charge.